I posted other photos of the Miyajima area here and here. 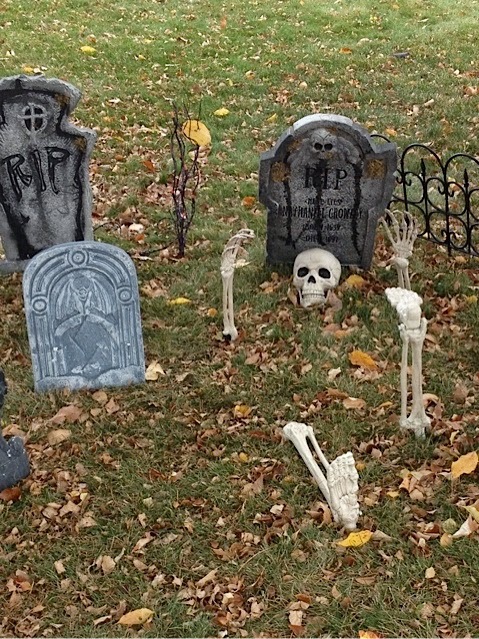 It's that time of year for Tricks and Treats, so keep your eyes open and be careful out there! 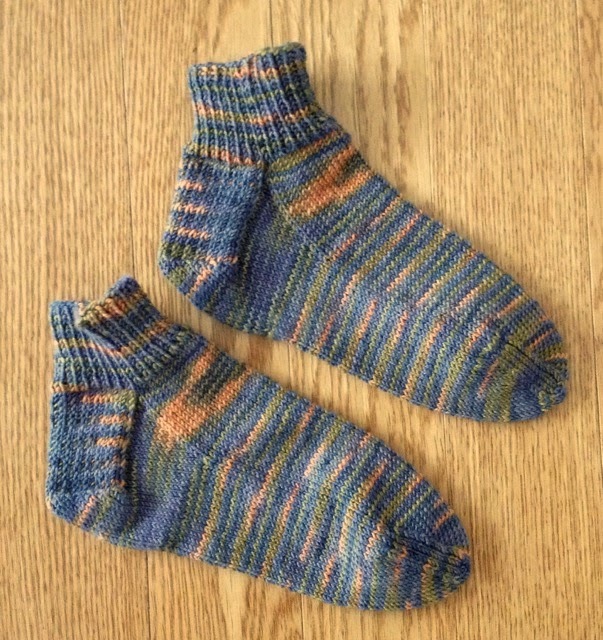 My sister's friend Kathy wanted to purchase a pair of hand-knit socks, so I selected some yarn from my stash and began knitting. Cherry Tree Hill yarn is wonderful to knit, and I was pleased that the socks were mates even without trying: the yarn pooled nearly the same on each side. 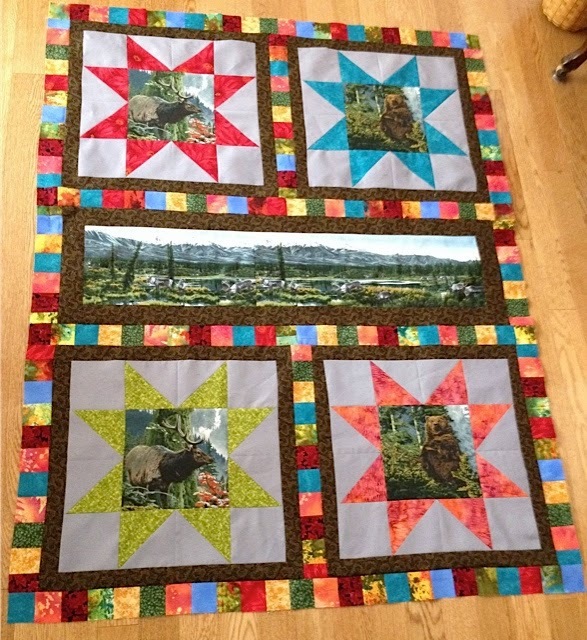 I had originally planned to use green for the final border, but it made the quilt too dark. The green will be used for the binding instead and should tie it all together. It was fun to sew with colors other than the traditional red, white, and blue. 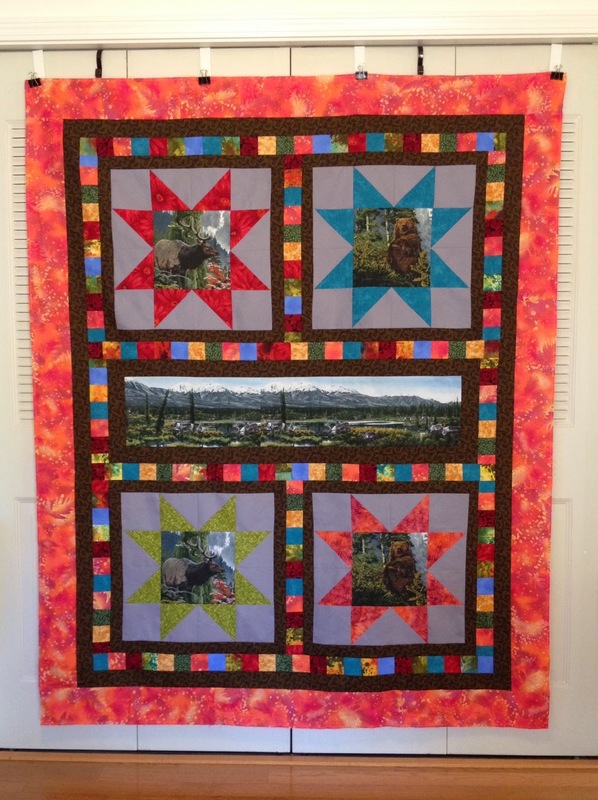 I'm sure a veteran who is an outdoorsman/woman will be drawn to this quilt. Other posts about this quilt can be seen here and here. 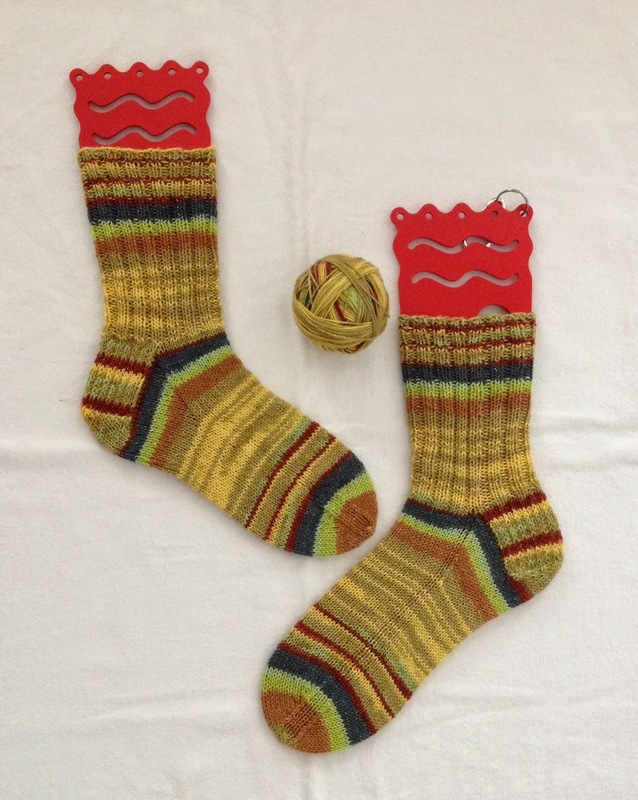 Socks are the same size, but the blockers are not which is why the sock on the right is stretched more than the one on the left. The yarn has a gold filament throughout which adds a bit of bling to the socks, but it is nearly impossible to capture in a photo. Thanks, Katherine for surprising me with two skeins of this lovely yarn. I hope to cast on another pair soon. 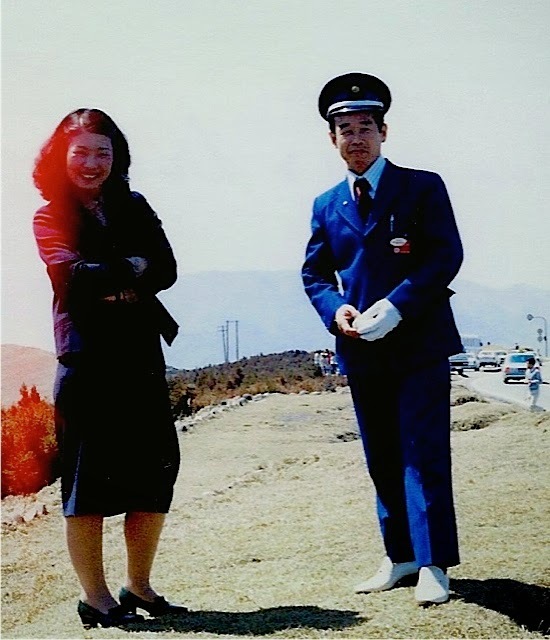 All of the bus tours that I took were amazing, mostly due to the professionalism of the bus lady (similar to a flight attendant on a plane) and the bus driver. Both wore uniforms, and they didn't differ much from company to company. The drivers always wore white gloves while driving and when assisting with bags. I wonder if the buses still have bus ladies and if the drivers still wear the uniform and white gloves. Wild and Free is progressing nicely. I made strip sets with 2.5 inch strips and then cut them into 2.5 inch sections. 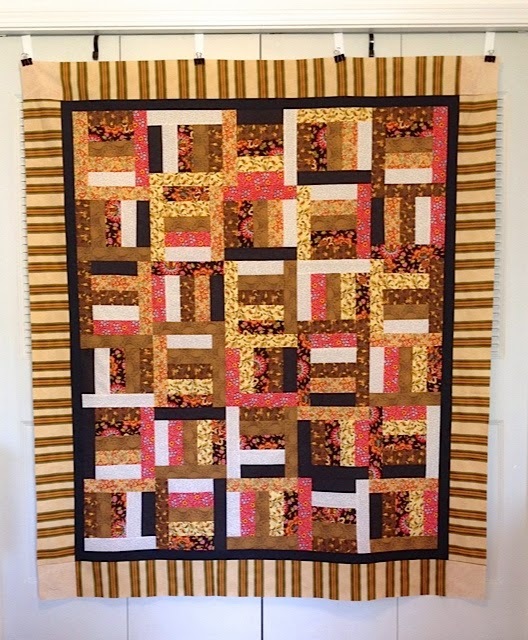 Once the star sections were framed with the strip sets, it was time to frame the center section with the brown and add strip sets to the side. If you look closely at the center panel, you will notice that I pieced two panels together, creating a longer (wider) panel. I tried to match the flow of the mountain range and hoped the caribou section would correspond as well. I am pleased with the result. I plan to add another brown frame around the entire piece and then a wide green border. While shopping in downtown Fargo several years ago, my two sisters and I went to JL Beers for a burger. If you've seen the movie Sister Act when the nuns walk into the bar, you'll understand the looks my sisters and I got when we walked into this bar and grill filled with young people. It was priceless, and I could almost hear them mutter: "If this turns into a senior citizen bar, then I won't be back." 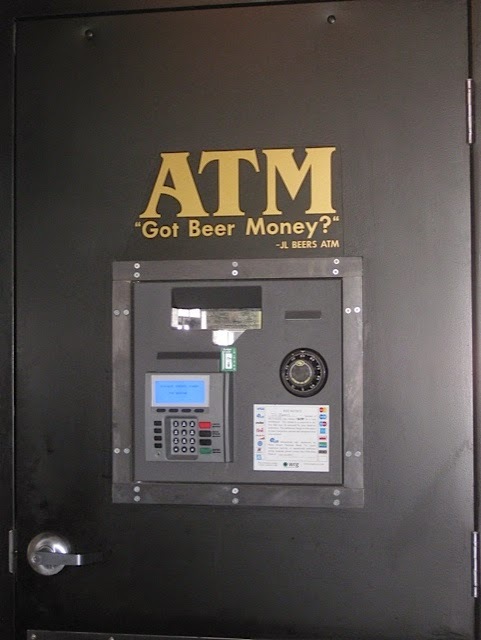 The food was excellent and the ATM in a door at the back of the bar was begging to be photographed. A photo of another unique ATM that I saw in Hawaii can be seen in this post. I sometimes like to wander through the local cemetery and stop and ponder the gravestones. This stone made me smile at its simplicity and playfulness, but I also wonder. . .
How old was Baby Snook? Did Baby Snook like to play with marbles or did an older sibling? Did tiny hands push the marbles into the cement under the guidance of Mom and Dad? What is the significance of the three marble holes at the top of the stone? Do they represent other family members? 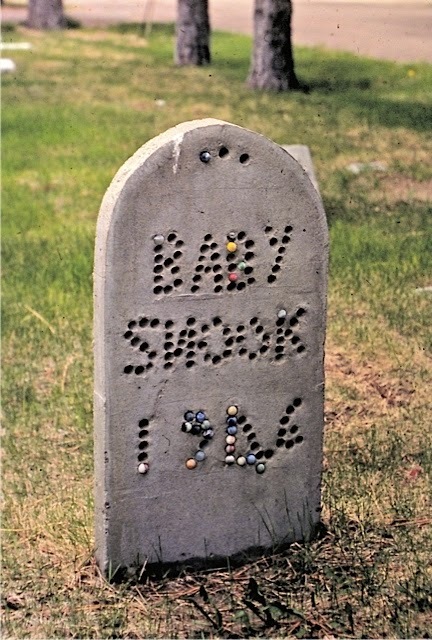 Do family members still visit Baby Snook's grave? I wonder. . . Do you? 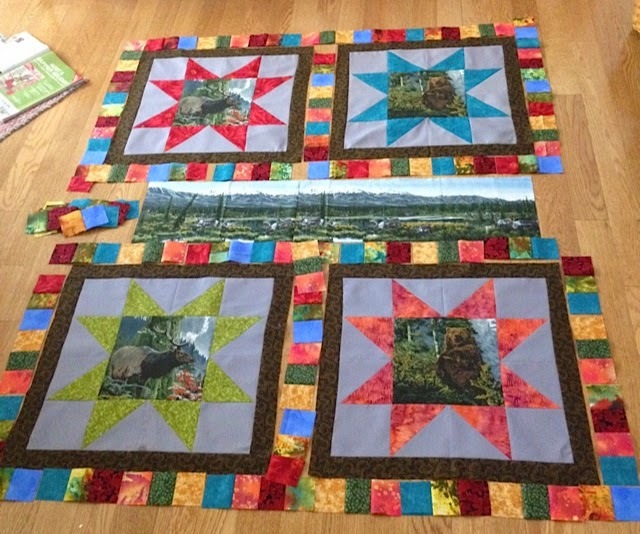 Several years ago I purchased two wildlife panels at a quilt shop. 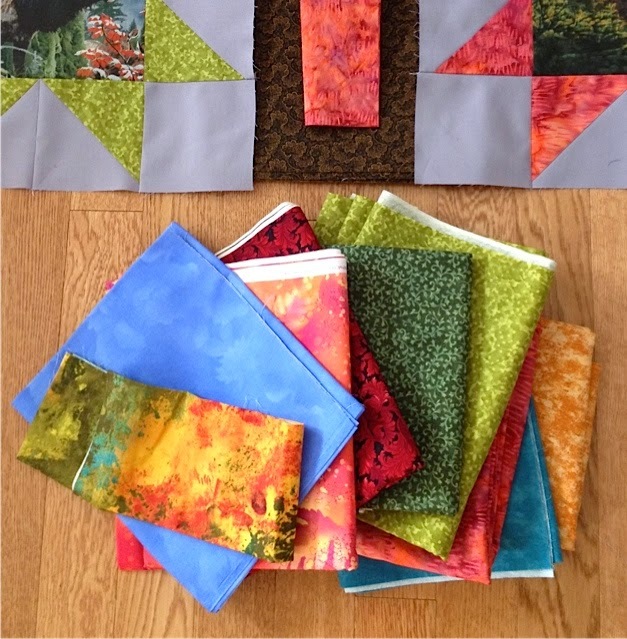 Then, I began purchasing colorful fabrics that I thought would complement the panels. Then the panels and fabric marinated for many, many months (okay, years) until I finally decided to do something with them. This summer, I pulled the fabrics and panels out and began dreaming, scheming and planning. Last week, I made the first cuts and turned the smaller segments into giant stars. 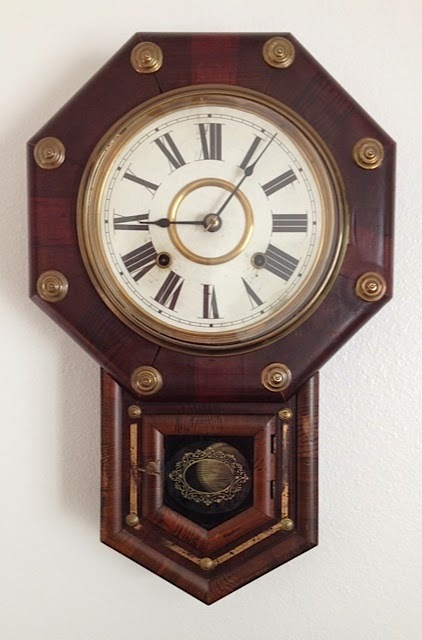 One of my most treasured mementos from Japan is an antique Schoolhouse Regulator Clock purchased at an antique shop, located next to the Misawa cemetery featured in these posts. The clock has a lot of character and has kept accurate time in my house since I purchased it in 1979. It is a 7-day clock, and I wind it usually on Sunday and yearly give it a squirt of WD40. 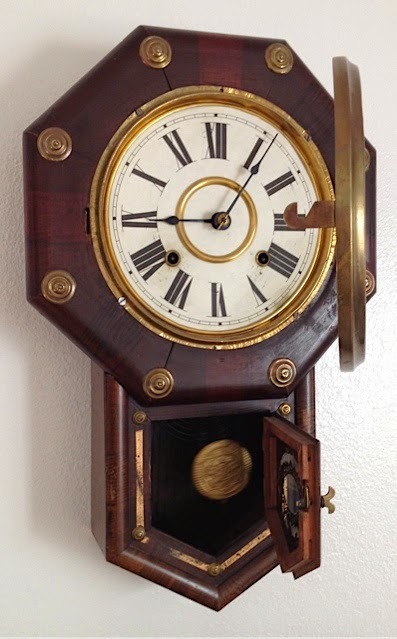 The clock case measures 19 inches from top to bottom. The steady ticking of the clock is soothing. I'm so accustomed to the hourly chime that I seldom hear it, even at night. Another regulator, a 30-day clock (purchased new in 1982) that chimes the hour and half hour hangs in my family room. 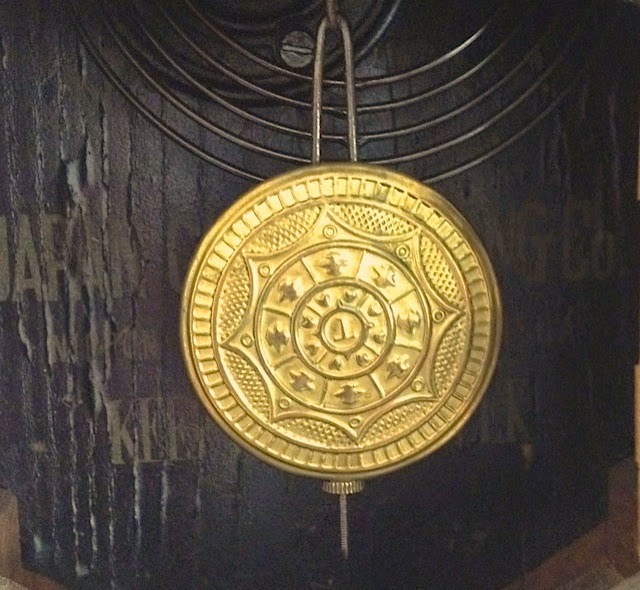 I'd love to know something about the previous owners of my antique clock, but sadly, I do not. I can only imagine the stories it can tell. Do you own any clocks that require winding? I don't remember when the yellow (some may say it was gold, but to my eyes it was yellow) recliner was purchased, but it was a favorite place for nearly everyone in the family to take a nap. 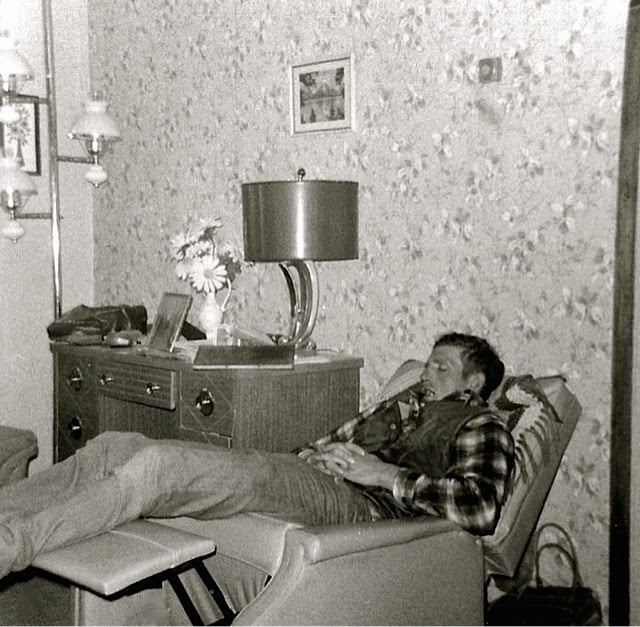 My brother often would nap on Sunday afternoons while watching TV. The photo of Rich shows the living room wall before it was covered with paneling. I remember helping my mother hang the beige and brown wallpaper shown in this photo. The lamp shade was often turned like it is in the photo to hide the hole a parakeet nibbled near the top. The desk, shown in the photo, was eventually moved into my bedroom. The top drawer on the right had a broken bottom piece, so it was tricky to open it without that section falling out. Note the pole lamp with the three lights. My mother used that pole lamp for years. Each light had a three-way switch and could be controlled as a group or individually. Note the toothpick tree on the corner of the desk. This was made by pushing hundreds of round toothpicks into several styrofoam balls and then stacking the toothpick balls into a tree shape. The "tree" was sprayed with "snow" and decorated with mini glass decorations. The fiberglass TV tray in the lower left corner were used for years as was the leather footstool that my mother made at an Extension Club workshop. My mother's stylish glasses seem to glow in this photo. Ironically, the frame design is popular again. 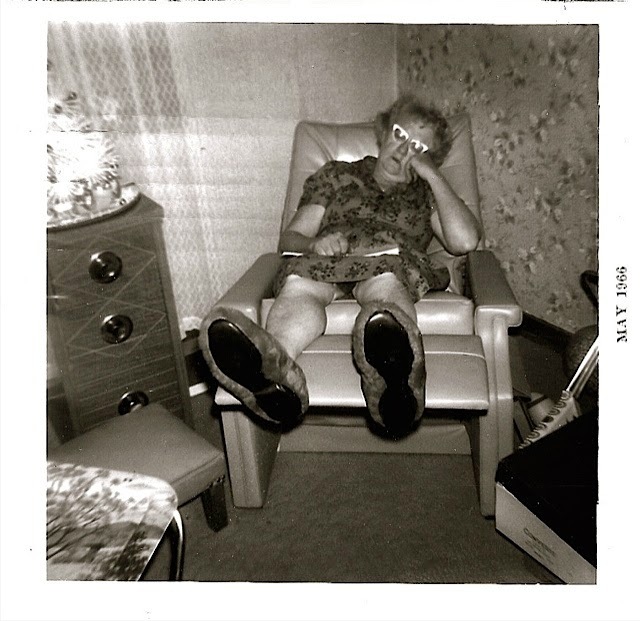 Did your family have a favorite chair for napping? Practically everyone in my family was/is a coffee drinker, so I have no idea why I prefer to drink tea. Perhaps, my paternal grandmother who grew up in England somehow willed at least one of her grandchildren share the love of a good cup of tea. That is the only explanation that makes any sense. My mother sometimes drank tea, but I drink it almost exclusively. I'll take a hot, cup of unsweetened, black tea any day of the year and any time of day. I do not like herbal or green tea. 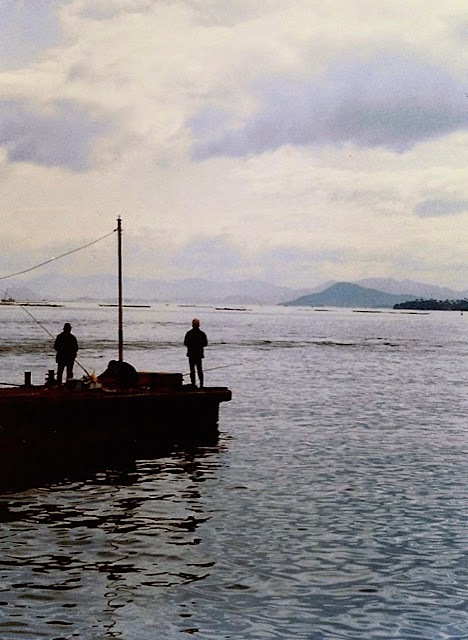 Several years ago, when my sisters and I visited Victoria Island and Vancouver, British Columbia, I discovered the Murchies Tea and Coffee shop. The variety of teas (and even coffees) they offer is impressive. 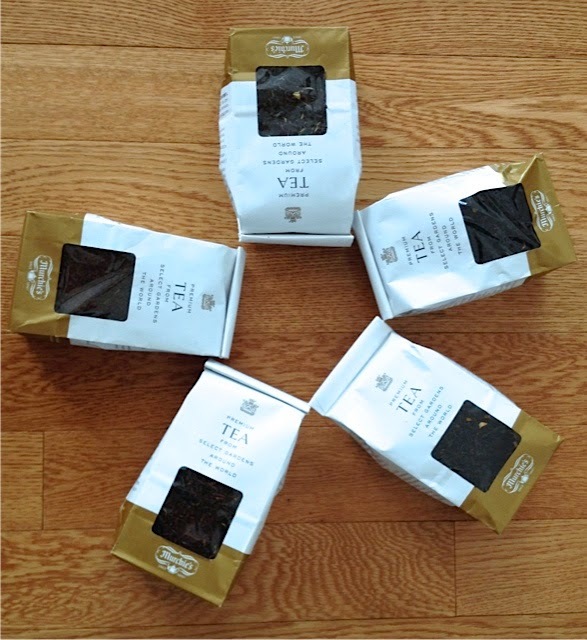 On that trip, I purchased several types of tea and have continued to order online from Murchies. Canadian Breakfast - a traditional breakfast tea, with a Canadian maple flavouring. 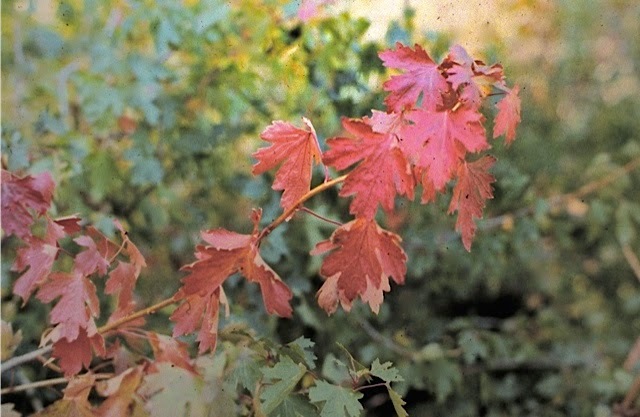 The maple helps to draw out the natural malty caramel flavours of the teas. Golden Monkey - the dried leaf is mixed black and gold, with a musky, fruity, slightly grassy aroma and produces a rich deep red-gold liquor, very round, full-bodied flavour with a slight briskness. The flavour and aroma notes for this complex tea include dried apricot or plum, honey or burnt sugar, and possibly a slight smokiness or light maltiness and it has a lingering, soft, ‘fuzzy’ finish. As far as addictions go, tea-drinking is fairly harmless. Do you prefer coffee or tea? Green tea or black tea? When I was teaching in Wheatland, I often drove the backroads to find bursts of Autumn color. The winding road through Sybille Canyon never failed to provide opportunities to pull over and capture the colors of Autumn. 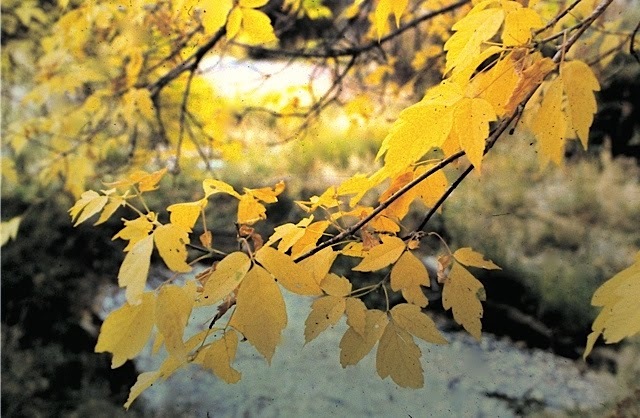 Autumn is a fickle season in Wyoming: sometimes snow flies before the plants have a chance to show their splendor; other times, color provides a glorious display that lingers. The pattern calls for 50 sts. on size 7 needles, using DK weight yarn. 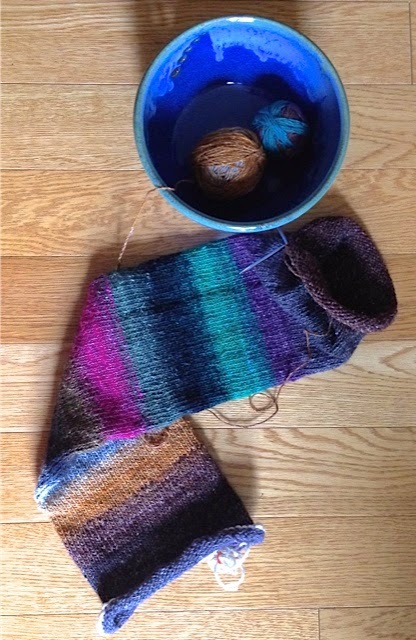 Since I was using sock yarn, I decreased the needle size and increased the stitch count. At 34 inches in circumference, the cowl is not long enough to wrap twice around my neck; however, it can be tucked flat to provide coverage under a coat. This is the first time I've used the kitchener stitch to graft so many stitches. I am pleased with the results. Do you like to "kitchener"? I don't know what this advertisement is trying to sell, but I find the image interesting. The children's heads strangely do not match the bodies, which I find a bit unsettling. What are your thoughts? It's in Japanese, so I can only understand bits of it. Looks like an ad for Children's Day (national holiday that was Boy's Day). Mothers' Day is mentioned in one of the boxes on the right. 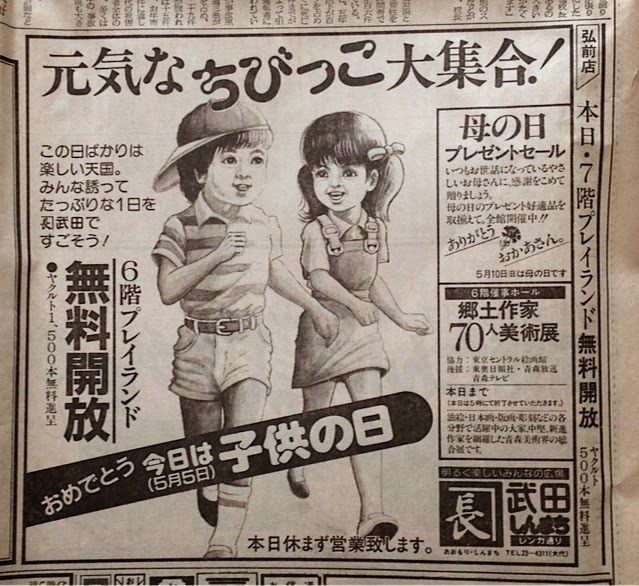 Oh, I just noticed the date, May 5, which is definitely Children's Day. So that mystery is solved, partially. These two cowls will be donated to a group collecting items for the homeless in Minneapolis, MN. 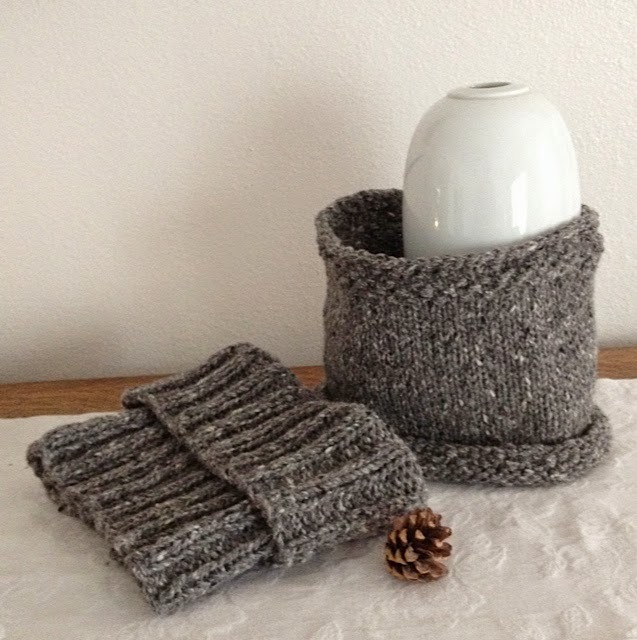 The cowls are knit (double stranded) from yarn reclaimed from a thrift shop sweater. I raveled several wool sweaters in 2007 and have used the yarn for many donated items. One of the posts I wrote on the process can be seen here, but all the posts on the reclaimed yarn can be found by clicking on the "reclaimed wool" label in the list of posted topics to the right or by clicking here. I find it very satisfying to repurpose or "upcycle" items from thrift shops. Many items can be used directly, but others can be "reclaimed" with a little effort and ingenuity. Do you visit and/or shop at thrift stores? I was growing weary of making quilts from red, white, and blue fabric, so this Quilt of Valor was made from some 2.5 inch strips (typically called a Jelly Roll) that I had in my stash. The pattern was extremely easy. 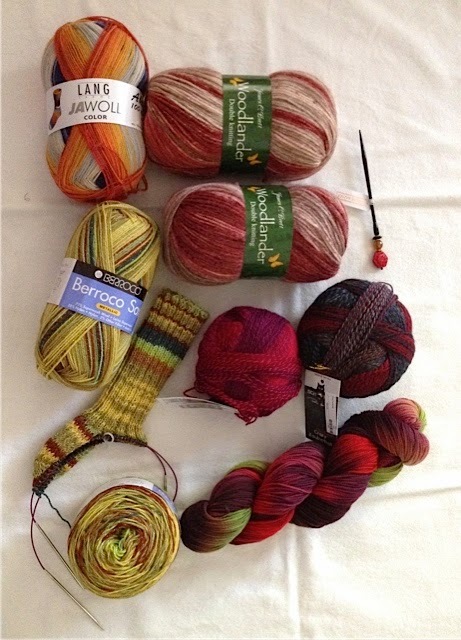 • my recent stash enhancement all started with the gorgeous Jawoll yarn. I won that skein from Ellen in September. • my knitting buddy, Cheryl, gifted me the beautiful twisted hank of sock yarn - the color way is Christmas Cactus. 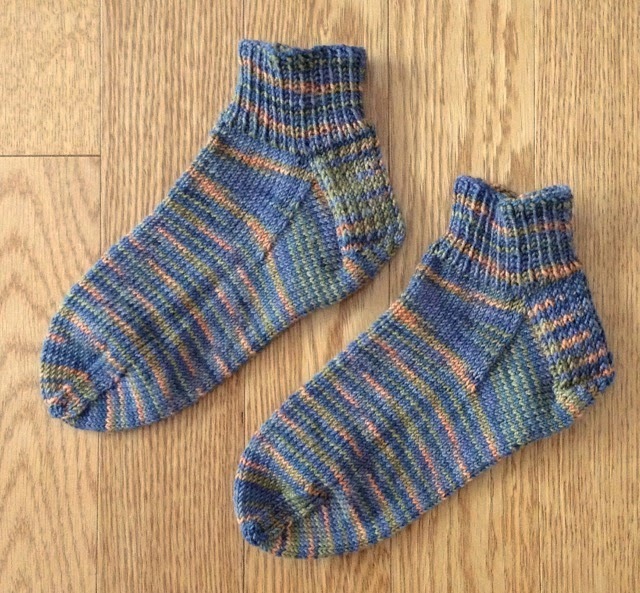 • blog buddy, Katherine surprised me by sending two skeins of the sparkling Berroco sock yarn. As you can see, I couldn't resist casting on. • two balls of Crazy Zauberball sock yarns were purchased at the Fiber Fest. I think Cheryl's yarn spurred me to purchase yarn out of my usual comfort zone of blues and grays. 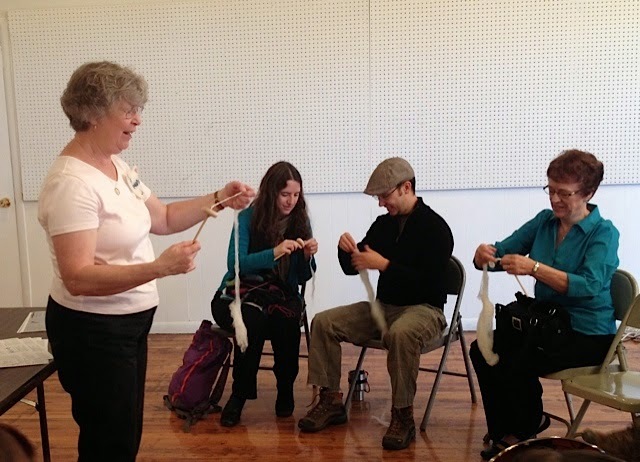 • two skeins of Woodlander worsted called out to me at the Fiber Fest, too. I don't have a plan for the skeins, but they will tell me someday what they want to become. • I've been looking for a shawl pin, and I found a fabulous one at the Fiber Fest. I've managed to enhance my stash considerably in the last two weeks, and it all started with Ellen and Cheryl. It must be their fault I've fallen off of the No Buy wagon, or at least that's my story, and I'm sticking to it. 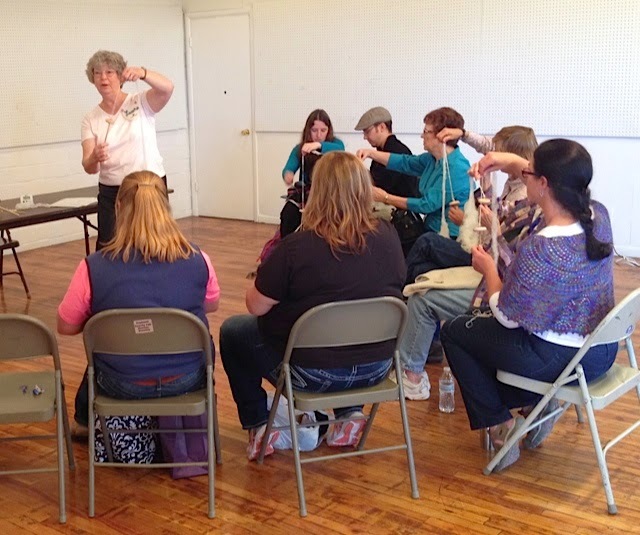 Saturday was a long day, filled with wonderful fiber goodness, conversation, and fellowship. 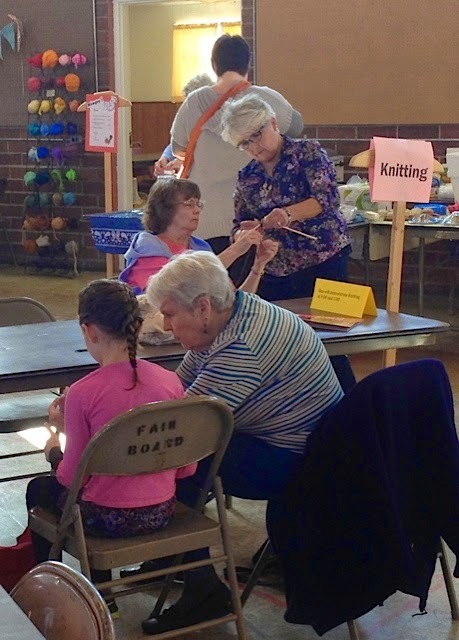 Fremont Fiber Arts Guild members gathered Friday afternoon to set up tables and assist vendors with their displays for the biannual Fiber Fest on Saturday. 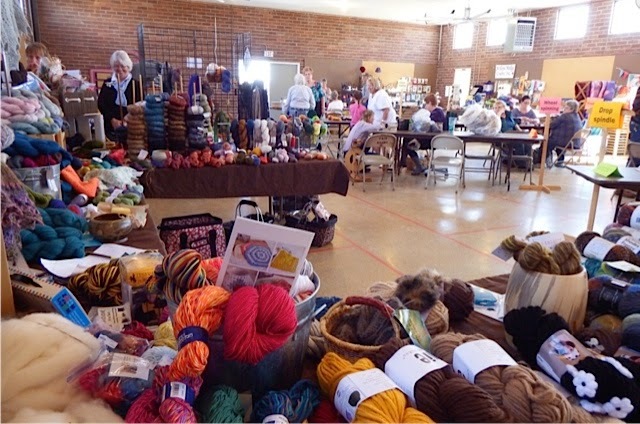 Five vendors displayed yarn, notions, roving, and other fiber goodies, and on Saturday six guild members demonstrated their crafts: wheel spinning, drop spindle, twining, crocheting, knitting, cinch making. In addition to giving demonstrations, guild members worked with those who had some prior knowledge or a particular craft but were struggling with a concept or a project. spindle and rug twining as well as observing the wheel spinning demos. Although the crowd seemed smaller this year, the event was well attended. County 10 published an online story and photos about the event here. I had fun experimenting (let's just say I'll never be a spinner) with some new crafts, demonstrating twining to several interested individuals, visiting with old and new friends, and enhancing my stash a bit.